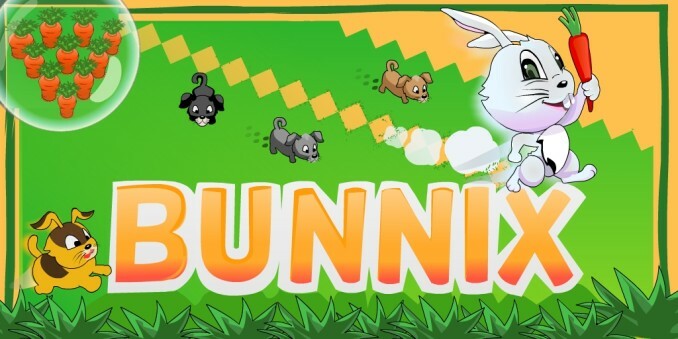 Bunnix is an action packed arcade game. The bunny family has to cover and conquer the grass and harvests in the farm that are patrolled by a group of blind dogs. The dogs don’t see the quiet footed rabbit eating the grass and collecting all the stuff, but their nose is as good as can be for any dog out there. So, the bunny has to avoid coming too close to the dogs at all times. Also, if the dogs smell its scent while covering an incomplete territory, it is a goner. The bunny has to mark his territories complete and be inside to be safe from these smart sniffing patrollers. The bunnies would also want to collect as many carrots and other goodies that they can. The bunnies can use tools, powers and accessories at their disposal to succeed in this difficult task. In this xonix style game bunny / rabbit must trick the blind dog / dogs with a good sniffing sense. The bunny must collect the carrot and dig grass by clearing it. The bunny must use all his charm, cuteness to dig grass and become a digger. The bunny has to dodge and escape dog and eat carrots.In this exciting fast fun game on a farm covered by fence, fight the dog and clear grass,eat juicy power ups. The leaves are flying and mud, puppy, rabbit everywhere.Use powers to put the dogs to sleep, slow their sniffing sense,or gain speed to steal faster.The hog , burrow , family, wont help bunny here as he is all alone in this run exciting free game. The dog may be quiet,but don’t mistake the animal’s silence.Because once the dog catches the bunny’s scent it can outrun the fast bunny. Enjoy this free bunny game. This bunny game is for everyone (kids, girls , boys alike ) .Don’t let the dogs shoot you down instead become a shooter .Bunny ran or racing for all the carrots he can eat.